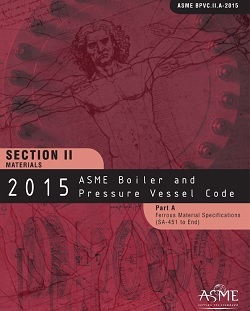 BPVC-IIA-2015 is a service book to the other Code Sections, providing material specifications for ferrous materials adequate for safety in the field of pressure equipment. These specifications contain requirements and mechanical properties, test specimens, and methods of testing. They are designated by SA numbers and are derived from ASTM "A" specifications. This product ships in two parts.